I’ve called these bags “cakeholes” because, well, they hold cakes. Of yarn. And I like to think of the phrase, “Shut yer cake’ole” (meaning shut your mouth) with a Yorkshire accent in my head! I used about two thirds of the skein of Red Heart With Love in cornsilk. After all those single crochet stitches, I’d had enough of it, though. The smaller bag with the Lion Brand Mandala inside is about 4.5″ across and 6″ tall, and the other fits a cake of Bernat Pop inside and is about 5.5″ across and 7.5″ tall. We have had some gorgeous weather lately but last night had a rain storm hit us. I woke up around 2.15am to the sounds of rain, wind and rattling windchimes. I quickly went and made sure that the windows weren’t open too wide because the south side of the house gets the brunt of the weather and we could have had rain blowing in. I noticed that the boys’ bedroom lights were still on. A few minutes later, I was back in bed when ds3 knocked on our door and said something which I didn’t catch (my good ear was on the pillow), Tai Chi Man jumped out of bed and left the room, and my sharp Spidey senses told me that something was up! Turns out there was water leaking through our son’s bedroom light fixture. Not good! We made sure to turn the light off and put out bowls on his bed and floor to catch the drips. He ended up sleeping on the couch in the living room which meant that those of us who went to work before he needed to get up for his own shift had to tiptoe around. No smoothie for me today as it would have meant running the Vitamix. If you have one of those you’ll know how loud they are. This morning, there was more heavy rain, but no wind, and no more dripping coming from the ceiling. Tai Chi Man called the roofers first thing – we actually asked them for an estimate nine months ago and if all had gone to plan the roof would have been done last fall. However the snow arrived and it was delayed until spring – which turns out to be a bad thing! We are now on the Urgent list and I hope we don’t have to wait too much longer. It did look lovely and green outside today, after the rain. The walnut trees are leafing out, the grass has greened up, we have our potatoes planted in the vegetable garden. At one point the cloud was so low I couldn’t see past my neighbour’s house. It’s rather a shame that we have this short window of green before everything crisps up in the scorching heat of summer. My brain is starting to give out – it was a long day at work after my disturbed night and my train of thought is derailing. Wishing you all a great day tomorrow. Well hello there, I’m back with more news of the March sweater. Yesterday was a heavy crochet day – I spent a LOT of time on the couch and almost finished the back. I did go for a walk in the evening with Tai Chi Man to get some fresh air and some blood flowing through the veins, though. The back was kinda boring, being all black, and it was nice to start on the coloured stripes for the right front today (after my 8am yoga class). My first Ravelry project page update, earlier today, showed that I had done five blue stripes and was just starting on the green part of the yarn cake. In order to keep the coloured sc rows fairly visible, I’m crocheting the black rows in the front loop only. This leaves a little extra colour visible on the right side. I’m also “cheating” with the colour. The blue did five rows and I made sure that the green would arrive on the sixth. So when I’d done five green rows I cut some out so that the acid yellow would appear on the next one. I want to make sure that all five colours in the cake appear across the front of the sweater (which is actually going to be a sleeveless vest with a wrap front). So that’s it for today. I’ve put down my hook for the night, even though it’s only 9.20pm. I’d rather go and get into my PJs and read in bed for a while because I’ve realised that staying up late is not serving me well. Thankfully I’ve finished all seasons of Mr Selfridge now, and am reluctant to start another series. It’s just too easy to binge watch episode after episode. So apart from crochet, this week’s entertainment is finishing A Dog’s Purpose (yes, the book that the film was based on, though I haven’t seen the film) and starting on the third book in the Poldark series, Warleggan. I gave a work shift away to a co-worker whose schedule was messed up so the coming week has me doing two shifts instead of three, which means…you guessed it…more crochet time! I estimate the March sweater will take no more than a week in all and then I can decide what to knit for April! Oh yes, and the Ravelry Ravellenic Games start on February 9th, and I am entering the toy event, so I need to do a bit of preparation for that before next Friday. I’m feeling happier about this sweater today because once I’d done some of the yoke decreases I put all the stitches onto spare yarn and tried it on. I was originally aiming for a 44″ circumference, which would have given me a lot of ease, but because of the tighter gauge it’s coming out at 40″. That means it will be fairly form-fitting and I was worrying about it being too snug. But no, it feels just great, so I am gaily marching on towards the neckline. The next decision will be how wide to make the neck. I want to add a big collar, maybe not a regular polo/turtleneck, but perhaps a split turtleneck. I’d like to have the option of buttoning it up around my neck, but also to open it up if I’m getting too hot (which is quite possible considering how thick the sweater is). I’ve added a couple of short rows in the back section tonight, with the plan to add a couple more later on. I finally learned how to work a wrap properly in the round. I can do the ones on the left end of a short row fine, but the challenge used to be that when I knitted all the way around and encountered the wrap at the right hand end of the short row I didn’t know the correct way to pick up the wrap without making a mess. Well, I found this tutorial. In it, she shows how to work the wraps – the left hand one is done the usual way that I’m familiar with, and the right hand one is done with a yarnover. When encountering the yarnover later, you slip the stitch before it knitwise, slip the yarnover purlwise, and knit them together. Hey presto, it worked! As this is such a bulky sweater, I also am using a slightly different technique than an ssk for my left leaning decreases. I can’t remember where I found it now, but the theory is that an ssk is very visibly different from a K2tog. When you’re doing mirrored decreases on a raglan yoke, it’s nice to have them look similar on each side. So instead of slipping one knitwise, then slipping another knitwise, putting the needle into the front of the two slipped stitches then knitting them together, I am doing this: slip one knitwise, slip the next one purlwise through the back, then knit them together. Sounds fiddly, but once you’ve done it a couple of times it’s just as easy and it does seem to be looking pretty good. My knitting has been accompanied by a TV series on Netflix that a customer at the store recommended to me. Mr Selfridge. And I am enjoying it immensely, and not just because it doesn’t have subtitles!! I have really appreciated the last two days off work. I met a friend for tea yesterday, and did the shopping (OK, grocery shopping is not very exciting but hey, it was a day off) and today I went to the gym then pootled around in the kitchen making the Burrito Breakfast Bake from my new book, The How Not to Die cookbook by Dr Greger. I’ve made a few recipes from that book now and have been pleased with them so far. The kids are not crazy on yams or cooked greens, which is a shame because they are just SO good for you! I still try and get them to eat them, though. This pattern is Nash’s Garter-Stitch Baby Sweater which is a pattern in a book, One More Skein. The first time I made it I followed the pattern. This time I did a quickie gauge estimate and cast on fewer stitches because of the bulkier yarn, and made it as a vest. The yarn is Euro Baby Maypole, and I had two skeins from my holiday in the UK last year. I made a random off-the-cuff knitted hat and only then decided to make the vest, so I wasn’t sure whether I’d have enough yarn. I was careful to keep my tails short and even cast off a stitch each side of the back section after knitting the two fronts. With self-striping yarn, you sometimes have to wind off part of the skein to get the colours to flow correctly. I managed to do that, though the two fronts don’t match! Well, I won the game of Yarn Chicken with this one. See that tiny ball in the photo below? That’s how much I had left from two skeins after finishing the hat and sweater. Eeek! I love the neat fastening – one tab pulls through the other and they button down. And the buttons are from my stash. Last night, I also made progress on the poncho, joining the two sections together. I shall have to get photos tomorrow in the daylight. I made the most delightful discovery yesterday, looking through what was available on Netflix. Outlander! Woo hoo! Diana Gabaldon fans will know what I’m talking about. We don’t have TV/cable/satellite and I thought I’d never get to see it. Well, I burned through the first three (hour long) episodes last night. I was a member of an Outlander group on Ravelry for a while and finally I can see what they were all talking about. And all the knits that they were talking about too! Good morning! This is an expected morning at home. I missed a call from my manager and showed up at work at about 9.15 expecting to start at 9.30 and she asked if I could do a 1 – 9pm shift instead. Someone who’s due to work this evening is sick and they need an extra body for the evening. So as I only live 5 minutes away, I readily agreed. In fact, I took the opportunity to try out the car wash that opened not long ago, just across the highway from the store, and I now have a white car again! It was fun. The car’s wheels get pulled onto a track that takes you through at just the right speed, so all you do is sit there and enjoy the ride. They also have vacuums you can use so that your mats get the treatment too. It was minus 11 Celsius while I was out there, so I had to keep my two pairs of knitted mittens on, and also be really careful not to slip on the ice underfoot. The cowl that was a mere WIP last time I posted is now an FO. I didn’t actually finish the two skeins of the Loops & Threads Facets after all. The person at work who is sick is a great lover of turquoise and lime, just like me, and I know she will love this cowl. So I measured it and it was 27″ long and just right for a single loop cowl. All it needed was a single crochet seam across to join the two ends, and voilà! The photo on the mannequin head shows the colours well, but the whiteness of the styrofoam is a rather glaring. This Agnes Lace Cowl used 130 grams of the yarn and an 8mm hook, the circumference is 27″ and the depth is 10″. I could easily make a bunch of these. 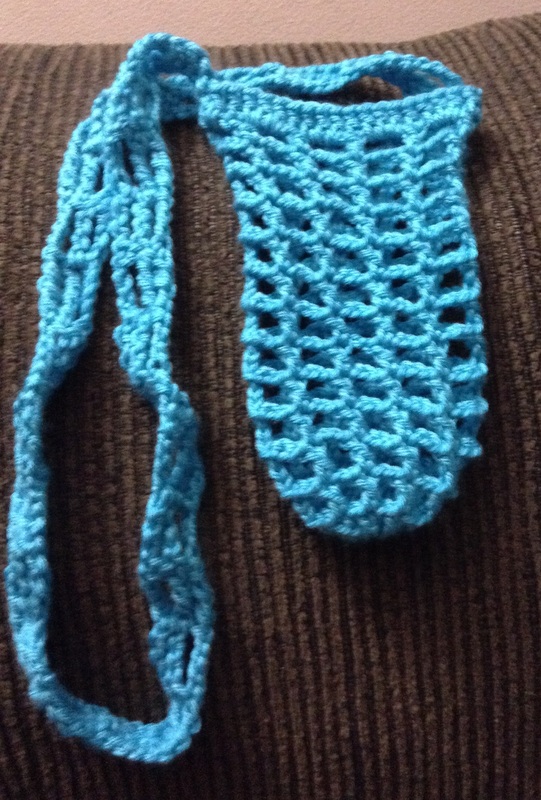 The stitch pattern is so easy and with the bulky yarn it grows fast. Maybe this would be a good stashbuster project with multiple strands of yarn (brain is ticking away here but at the same time telling me I should keep going on the baby blanket). Speaking of the blanket, I have now finished row 4. I decided last night that my studies could wait and that I would focus on the blanket while watching Netflix. Have you seen No Tomorrow? A fun series with an important underlying message – seize the day! Time to go and have some soup. Have an awesome weekend with lots of warmth and crafting. It’s been a very pleasant weekend. Yesterday I was walking along the lakeshore with Tai Chi Man and ds1 in the sunshine. I made dinner then watched a lovely movie for the second time – About Time – which involves time travel but not in a cheesy way, with an important underlying message and a triple-Kleenex ending! I picked up the Grandma’s Knickknacks blanket and added some more squares and was just two short of finishing my goal of 144 squares. This morning, we had to buy groceries, but afterwards I finished the 144th square! I am so relieved! I still have to add a border but this point has been nine months in arriving so it feels like time for a little jumping up and down. It’s about 45″ square amd I estimate a time investment of at least 48 hours so far. We went out to lunch with friends, one of whom is leaving town next week, and she gave me some bits and pieces that she needed to clear out, including lots of sewing thread (very useful) and three balls of yarn. Loops & Threads Soft & Shiny (burgundy) and Velveteen (royal blue). Now that we’re back home, I’m itching to start on that blanket border. My only other WIP is this pair of slippers. And this is a sunny photo of my Road Trip scarf. No, not me. Vexed is the name of the show I’ve been watching this week on Netflix. Amusing detective series based in Britain. It makes a good accompaniment to crocheting squares and tonight I have added FIVE, yes, FIVE squares to the blanket. I also finished a water bottle carrier. It’s the one in my sidebar, the Hiking Hydration Unit, of which I made lots last year. After finishing the wavy cellphone bag last week, I decided I needed a coordinating water bottle holder. It’s late, so I’m just going to pop a couple of photos in here and go to bed. Good night! I bought some really cheap fabric at work the other day. It was $3.60 a metre after the 70% discount so I went mad and bought four different prints. I took a look online and found a tutorial for an Easy Knit Skirt at Sugarbeecrafts.com that looked simple enough. I followed the instructions fairly closely, using the whole width of the fabric for the main part of the skirt, and seaming it only once rather than at each side. I like it. It’s comfortable and I could actually go a bit smaller on the waistband for the next one. For a maxi skirt, it took only about 1.2 metres of fabric. Here’s Thorin’s Hooded Cowl so far. The cowl part is finished and I’ve bound off half of the stitches and started the hood bit. There’s a short straight section before increasing for the shape of the head. I’m almost at the end of two skeins of yarn so will definitely have enough to complete this project – in fact I suspect two skeins will go back into the stash. And the latest Netflix show I’m watching? Last Tango in Halifax. On the recommendation of a friend, I started watching today, having exhausted all seasons of Psych. That’s the Halifax in England, not Canada. Very entertaining! Once again, I’ve run out of waking hours and it’s time to retire and recharge my batteries. Happy Friday!